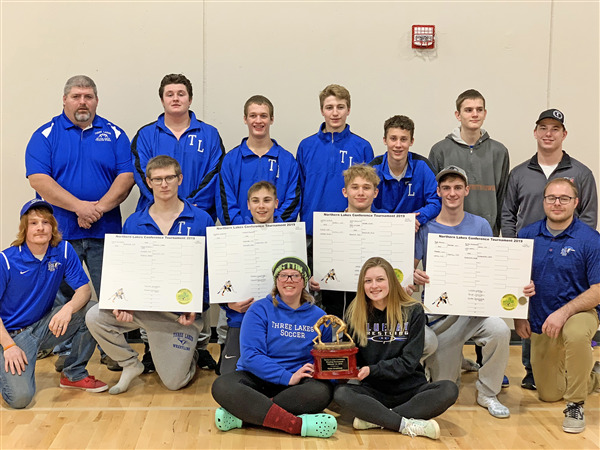 The Three Lakes-Phelps wrestling team are Northern Lakes Conference (NLC) champions after winning four individual brackets at the conference tourney held this past Friday in Elcho and getting seven wrestlers to the finals overall. Senter complimented his wrestlers following the tourney saying individually he was impressed with a number of efforts. Senter said Jesse DuPuis looked “fantastic” at the 145-pound class where he won an NLC title. Lucas Wanty pinned his way to the finals and came away with a championship at 132 pounds. Piersson Czaplinski continued his stellar freshman campaign as he claimed a conference crown at 113 pounds. So too did senior Connor Kincaid who at 182 pounds won his first NLC title after finishing runner-up a year ago. Zander Ginet, Bean and Canto Ginet each reached the finals in their respective brackets. This weekend in Crandon the team will see the exact same rosters as they did at the NLC tourney, with Crivitz added into the mix. Wrestlers will need to finish in the top two in order to advance through to what might be one of the toughest wrestling Sectionals in all of Wisconsin. At Division 3 Sectional, wrestlers who finish in the top three will advance to the WIAA State Meet. The Auburndale Sectional will include a roster of what Senter said could be the toughest lineup of previous WIAA State place winners with as many as 20 athletes who stood on the podium in Madison last year returning to the mix this season. All WIAA?Regional meets will take place this Saturday, with Sectionals set for the following weekend, Feb. 16.